Dark Wolf's Fantasy Reviews: Graphic novel - "Locke & Key: Welcome to Lovecraft"
Graphic novel - "Locke & Key: Welcome to Lovecraft"
"Locke & Key: Welcome to Lovecraft"
Locke & Key tells of Keyhouse, an unlikely New England mansion, with fantastic doors that transform all who dare to walk through them.... and home to a hate-filled and relentless creature that will not rest until it forces open the most terrible door of them all...! Acclaimed suspense novelist and New York Times best-selling author Joe Hill (Heart-Shaped Box) creates an all-new story of dark fantasy and wonder, with astounding artwork from Gabriel Rodriguez. If you ask me what is the first thing I can think of when it comes to Joe Hill I’ll answer momentarily that I know he is the son of Stephen King. That is a bit unfair since he is building an own career as a writer, but with each Joe Hill’s work I read my perception changes. And his collaboration with the artist Gabriel Rodriguez at the graphic novel “Locke & Key: Welcome to Lovecraft” brought me one step closer to my recognition of Joe Hill as a wonderful author and as one of my favorites. “Locke & Key: Welcome to Lovecraft” is the story of a family shook by a tragic event. Joe Hill builds a good story, with a conflict that will discover roots in the family history. And that roots will build a second storyline that as this volume suggested me will be developed in a future book. The novel mingles a dark and unfortunate reality with mystic and supernatural aspects in the creation of a page turner story. And in the center of this story we find the Lockes and it is here where I believe that Joe Hill excels. All the characters, with a smaller or bigger part in the story, are strong. Each one of the characters is uniquely defined, with a different personality, an inner turmoil and a personal way at dealing with their problems. From these characters my favorites are Bode, the younger member of the Locke family and who behaves as a very true six year old child, innocent, playful and funny, and Sam Lesser one of the negative characters, a very convincing villain, intelligent and disturbed. All that Joe Hill builds with his writing is perfectly complemented by the art made by Gabriel Rodriguez. Each character receives a proper visual characterization, each of their actions and emotions is reflected in the drawings. 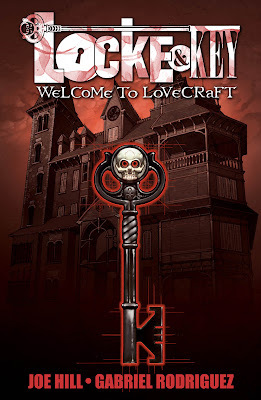 The settings are beautiful realized, with the Keyhouse, the main setting of the story, the piece of resistance of “Locke & Key: Welcome to Lovecraft”. All the images contribute in full to the atmosphere of the story, helping it to build the tension and helping to raise the pulse of the reader through visual effect too. It is true that in some places the images are a bit too gory and violent, but considering that at its basis the story is a horror one than maybe there is no exaggeration in them. But with such a perfect relationship between the story and the art is no wonder that I was drawn instantly into the heart of the novel and I couldn’t stop until the last page was turned. “Locke & Key: Welcome to Lovecraft” is a magical graphic novel, where once again Joe Hill convinced me of his talent and where I discovered a talented illustrator, Gabriel Rodriguez. I can’t wait to get my hands on their next graphic novel, “Locke & Key: Head Games”, and why not on another future collaboration between Joe Hill and Gabriel Rodriguez. It seems I have to take a deeper look after reading your good review.